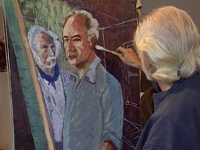 This DVD explores the life-enhancing impact of continued creativity and artistic expression--well into the later years! It uses brief excerpts that profile the creative process of elder artists, introduces us to a 90-something actress who grabs life with both hands, and demonstrates how creative expression can even transcend dementia. The DVD also includes a section on the work of the late Doctor Gene Cohen, co-founder of the Creativity Discovery Corps, who was best known for championing the limitless potential of the aging brain.